Testosterone is one of the most important hormones in the male body. It facilitates growth during puberty, and it also plays an important role in your health through adulthood. Testosterone levels naturally decline with age, but in today’s post, we’ll provide you with a few ways to keep your testosterone levels high as you age. Some men require medical intervention in order to keep their testosterone levels healthy as they age. 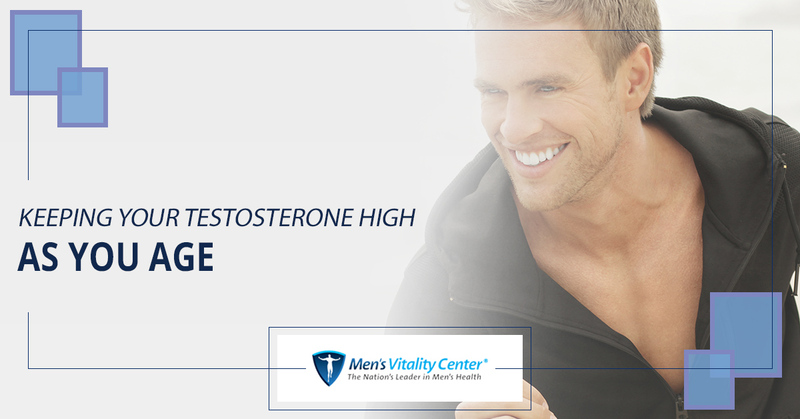 Men’s Vitality Center is the go-to provider of testosterone replacement therapy in Tempe, so don’t hesitate to get in touch with us to schedule an evaluation today. With our schedules busier than ever before, you probably find yourself burning the candle at both ends from time to time. Whether you’re up late due to an overloaded work schedule or you’re experiencing frequent insomnia, one thing is certain: a lack of sleep lowers your testosterone levels. This is because your body produces the fight-or-flight hormone, cortisol, to help you cope with the stress on your body caused by sleep loss. While cortisol acts as a stimulant to keep your body going, it directly lowers your testosterone levels as a result. Exercise is one of the best ways to keep your entire body healthy, but exercising frequently will also keep your testosterone levels high as you grow older. Intense exercise such as lifting heavy weights prompts the body to release testosterone, and recent studies have shown that high-intensity interval training (HIIT) is also an incredibly effective way to increase testosterone levels. Though these two forms of exercise will deliver the best results, staying active and getting regular exercise will help you keep your body healthy and in shape as you age. Bisphenol-A, also known as BPA, is a chemical found in plastic items that can transfer to food and drinks when exposed to heat. BPA has been shown to lead to low levels of testosterone and infertility in those who are regularly exposed. In fact, one prominent study shows that men who were regularly exposed to BPA had low levels of testosterone and thyroid stimulating hormone, a hormone responsible for the body’s metabolic rate. Moreover, 89 percent of the men with fertility problems have higher-than-normal levels of BPA in their urine samples. Many older cups, water bottles, plates, bowls, and other plastic items have BPA in them, so switch to BPA-free options whenever possible. Glass, stainless steel, and other non-plastic containers are also excellent choices. If you suspect that you are suffering from the symptoms of low testosterone, then you should consider scheduling an appointment for testosterone replacement therapy. At Men’s Vitality Center, we provide our patients with bioidentical testosterone injections once per week to help alleviate the troubling symptoms of low testosterone. Many of our patients see an improvement within three weeks, so don’t wait to schedule your appointment. Get in touch with us by filling out the form below. We look forward to helping you live a healthier and happier life!